Surprise your wife this year with an Easter basket of her own. The wife is often forgotten in the Easter gift exchanges, since most people focus on the children. 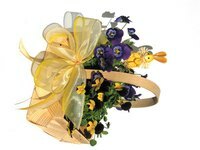 Wow her with gifts catered to her personality and special interests this year in a basket she can use again or display in your home. Pamper your wife with a manicure set and items she can use to enhance the youthful look of her hands. Include a crystal fingernail file she can carry in her pocketbook. Add a nail polish set complete with nail hardener and protective coating for that final layer of polish. A French manicure set is delightful for the woman who loves that finished look. If your wife is all about the bling, include whimsical gemstone stickers she can adhere to her nails. Sea salt scrubs remove dead skin cells while giving her hands a youthful appearance. Pair the salt mixture with an emollient that is lightly scented in her favorite fragrance. She can also use this combination on any dry patches on her feet or elbows. Fill your wife's Easter basket with items that will take her away or at least allow her a few hours of calm and tranquility. Soy-based candles burn clean and come in several soothing aromatherapy scents to help her relax. Purchase a bathtub pillow so she can lean back in a hot bubble bath or soak in body oils or salts. Don't forget the music. New Age sounds can lull her into a peaceful state while you take care of the kids. Encourage your wife's love of art, sewing, knitting or cooking with a basket full of items she can use to indulge in her favorite pastime. Purchase several art lessons for her and include the syllabus in the basket along with the required instruments she'll need for the class. Paintbrushes, paints, a small canvas journal and a table easel will put a smile on your resident artist's face. Cashmere yarn and new knitting needles in a basket actually made for this craft is another thoughtful idea. If she is itching to try her hand at cake decorating then include tools of the trade after a quick trip to your local crafts store. Surprise the gadget-hungry woman in your life with the latest and greatest this Easter. While this is by far the most expensive idea, if you can afford to splurge on these items, your tech-savvy wife will appreciate this gesture. Pick up that new e-book reader and tuck it in the center of all that nylon grass and silk flowers you use to fill the basket. Don't forget the music player, complete with wristband holder for those early morning jogs. In the card you place in the basket, give all pertinent information regarding those free downloads you've included in this ultimate Easter basket surprise.